Taylor always gets what he wants—until now. This modern high school adaptation of Pride and Prejudice is a battle of wits as Chloe desperately tries to remain the only girl who can avoid the inevitable—falling for Taylor. I have been anxiously awaiting the arrival of this book for review. When it came in the mail yesterday I paused the book I had been reading to start this immediately. 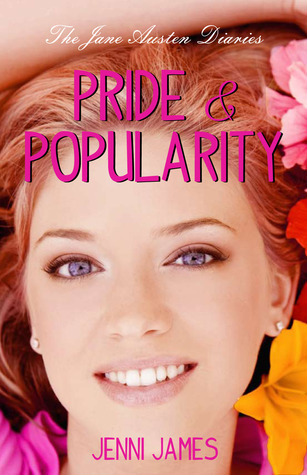 Once my kids were in bed at 7:30 last night I started reading Pride and Popularity and couldn’t put it down! I stayed up until 1:30 in the morning to finish. I’ve never been happier to lose sleep. I was still happy this morning. You can’t help but be happy when reading this feel good book. Thank you Jenni for the fun night! I know I’ve said this before, but let me remind you. I love retellings! There is something peaceful and relaxing about knowing how a book will end but not knowing how it will get there. I love Jane Austen books and her characters. Before I began reading I knew I would love the “Elizabeth” and “Darcy” characters, and I was right. Chloe and Taylor are so fun! The chemistry between Chloe and Taylor is amazing! Don’t worry, it wasn’t steamy or anything. 🙂 I loved every scene with Chloe and Taylor whether they were hating or loving each other. The tension was so great. Chloe was fiery, prideful, and afraid of getting hurt. She surprised and mesmerized Taylor. I don’t think I’ll say any more about how these two change throughout the book; I’ll let you read and find out for yourself. This was a fun, light, clean read that I loved! If you’re in the mood for a light-hearted fiesty romance go read this book! Next postYoung Adult GIVEAWAY Hop!